Foamed concrete (CLC) panels can be used to build partition or non-load bearing walls. These pre-cast panels have hollow cores to reduce weight and gooves so that they interlock. 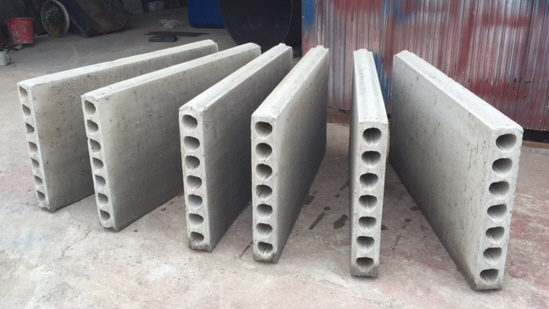 They are made from 950 kg/m3 foamed concrete so they have plenty of strength, but due to the hollow cores the overall density of the panel is 633 kg/m3. Since the panels are bigger than blocks, it is much quicker to construct a wall with the panels. Another similar design are 60 x 50cm interlocking panels. 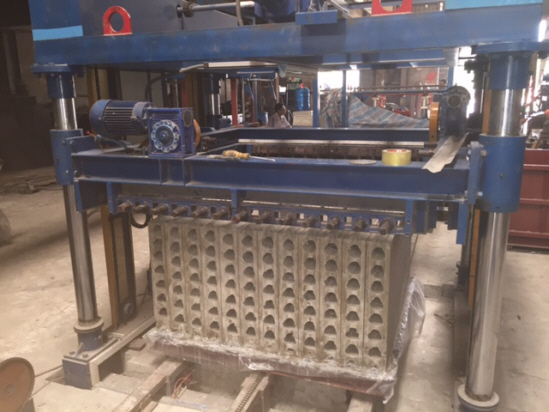 The relatively large size compared to regular size blocks, and the interlocking design, means that these hollow core foamed concrete (clc) panels can be assembled into a wall far more quickly than regular sized blocks can. They are easy to handle since each panel can be lifted by two workers and/or by using simple lifting equipment. The hollow cores mean that less material is used to make the panels. The overall density of the panel being 633 kg/m3 compared to typically 800 - 1200 kg/m3 for regular sized foamed concrete blocks. The low weight of the panels means that there is reduced loading on the building. This means that cost savings can be made on structural elements and foundations. The hollow cores make convenient conduits for services such as pipework and cables. Foamed concrete is fire proof and it provides good thermal and acoustic (sound) insulation. 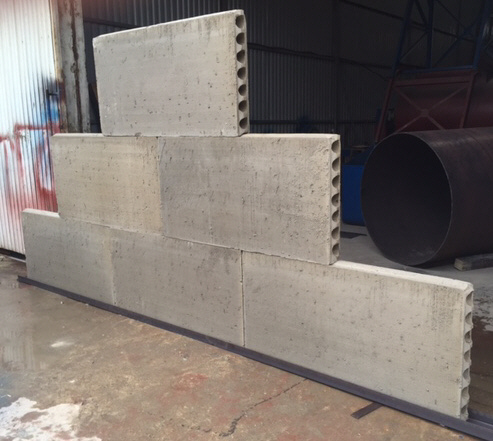 To make the pre-cast panels, foamed concrete is poured in to a large mould which includes tubes to make the hollow core. After 3 - 4 hours the large block of foamed concrete can be cut with an automatic wire cutting machine to make 12 panels. Once the panels have set for a bit longer the tubes for creating the hollow cores can be removed. As with foamed concrete blocks, the panels must be cured for 28 days before they are used. To find out how you can make these panels please contact us.